When I like something nowadays, I keep saying “Super”. Super takes the spot along with “Awesome”, “Great” and “Cool”. I don’t know where or how I picked up this habit, but it seems to be here to stay. There is another (slightly different) “Super” around the corner. It is TiE Chennai Super Saturday – an event I always look forward to. It is turning out to be really “Super”. We received over 16 pitches and we are going to do about 10 of them (due to time constraints) in the morning PitchFest. We will have another session for the rest of the pitches, during the Unconference track. PitchFest is a bit unique. The Top 3 will get some cool sponsorships. We are going to have an awesome session by Raghu Rajagopal. Raghu is a serial entrepreneur and a startup evangelist. He also runs an incubator. He runs several companies (not sure how he manages that) and interviews entrepreneurs for his column in Business Line. He is going to share with us a lot of the lessons of entrepreneurship – his own and the ones from the entrepreneurs he talks to. I am really looking forward to that session. We also have one of the best minds of marketing teaching us Marketing 101. When I heard J K Iyer (popularly known among us as JK), I was simply blown away. He was a professor then.He is with Consim, now (http://www.consim.com/). His style of teaching is unique, informal and very conversational. I look forward to meeting him and eager to hear his views now that he is part of the industry. We have an unconference session in the after-noon. I love this session because we hear the voice of the audience – YOU. These sessions are always full of surprises and lots of learning. If you have not registered, please do so immediately. Look forward to seeing you there on Saturday (2nd). TiE Chennai Startup Super Saturday on March 2nd at IITM Research Park, Taramani. https://chennai.tie.org/event/13/start-sig-unconference. The author of Learn Python The Hard Way has some great advice in “Advice from an Old Programmer. From 16 Rules of Social Media Optimization a free white paper (requires registration). The white paper covers SEO and SMO (social media optimization) and provides good advice. The only funny thing is that this site violates one of their own rules. I will let you find out which. If you do, let me know. 12. The IT-ITeS industry has four major subcomponents: IT services, business process outsourcing (BPO), engineering services and R&D, and software products. growth of computer services in these economies is well above the average of the top exporters. A few companies from Chennai – OrangeScape, FreshDesk etc. benefitted from Sramana’s 1M/1M program. The advice and the PR they received from her were very valuable. We thought that we should make it available for a few entrepreneurs in Chennai. So we went ahead and did two things. Requested Sramana to give a discount on her premium membership and she was kind enough to agree. We also found a few sponsors to pay 50% of the remaining amount for the top 3 companies who are selected during Pitchfest on March 2nd. In addition, we are assembling a good team to share some marketing and sales ideas for growth. We do have the unconference sessions that all of us enjoy so much. You can find more details and a registration link here. Registration deadline for pitches is Feb 25. From Fixing The Schools a Sketchbook from Kauffman Foundation. 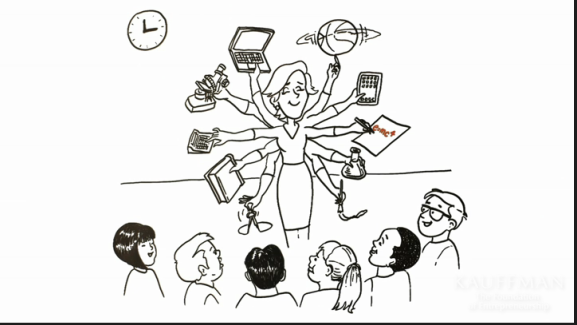 This picture is a great depiction of how a teacher needs to play multiple roles. Once in a while, I slip into a fantasy world. Normally it is triggered by some article or book I read or some movie I watch. It may be because I love SciFi – though, I am not finding time to doing much of that nowadays. It does not matter why. I kind of like being a bit of a nut, hoping to see galactic travel in the next couple of decades by humans. Now that I know about 100yss my hope has gone up a couple of notches. It’s the first commercial product to be offered for sale by LaserMotive, which was founded in 2007 by a group of physicists and engineers, winning the NASA Centennial Challenges Power Beaming Challenge in 2009. LaserMotive has received NASA contracts and partnered with companies including Lockheed Martin in the process of developing and testing its power-beaming technology. I have a couple of students working on some cool power beaming technology as well. But that is low power and is on a very small budget. Right now it is very experimental. Once we have a small demonstrable prototype, will write more about it. The Biopython Project is a collection of freely available Python tools for computational molecular biology. The web site provides an online resource for modules, scripts, and web links for developers of Python-based software for life science research. A standard sequence class that deals with sequences, ids on sequences, and sequence features. Code to perform classification of data using k Nearest Neighbors, Naive Bayes or Support Vector Machines. Code for dealing with alignments, including a standard way to create and deal with substitution matrices. Code making it easy to split up parallelizable tasks into separate processes. GUI-based programs to do basic sequence manipulations, translations, BLASTing, etc.. Integration with BioSQL, a sequence database schema also supported by the BioPerl and BioJava projects. via TopicMinder alerts for Python. Watson is an artificial intelligence computer system capable of answering questions posed in natural language, developed in IBM‘s DeepQA project by a research team led by principal investigator David Ferrucci. Watson has ingested more than 600,000 pieces of medical evidence, two million pages of text from 42 medical journals and clinical trials in the area of oncology research. Watson has the power to sift through 1.5 million patient records representing decades of cancer treatment history, such as medical records and patient outcomes, and provide to physicians evidence based treatment options all in a matter of seconds. The core of the technology is available through Apache Foundation’s UIMA Project. You can look at sites and services that take advantage of UIMA’s capabilities. Applog is a series of curated links of innovation applications of emerging technologies.